1. Charter. The charter authorizing the organization of this Chapter shall be granted by the Board of Directors of PFLAG, Inc.
2. Bylaws. The Chapter shall be subject to the Bylaws of PFLAG, Inc., a copy of which is attached. The Bylaws of PFLAG, Inc., by virtue of their attachment to these Bylaws, become part and paqrcel of these Bylaws, as if reiterated herein. 1. Support PFLAG, Inc. The Purpose of this Chapter shall be to support the mission of the PFLAG, Inc. organization; to promote the health and well-being of gay, lesbian, bisexual, transgender people, and others in our community. Under no circumstances shall this Chapter fund, endorse, or contribute in any way to the election campaign of a candidate for public office, or act in any way as to jeopardize the status of PFLAG, Inc., as a tax-exempt corporation under Internal Revenue Code section 501(c)(3). 2. Limits. The Chapter shall take no legal action without approval of the Board of Directors of PFLAG, Inc.
3. Logo. 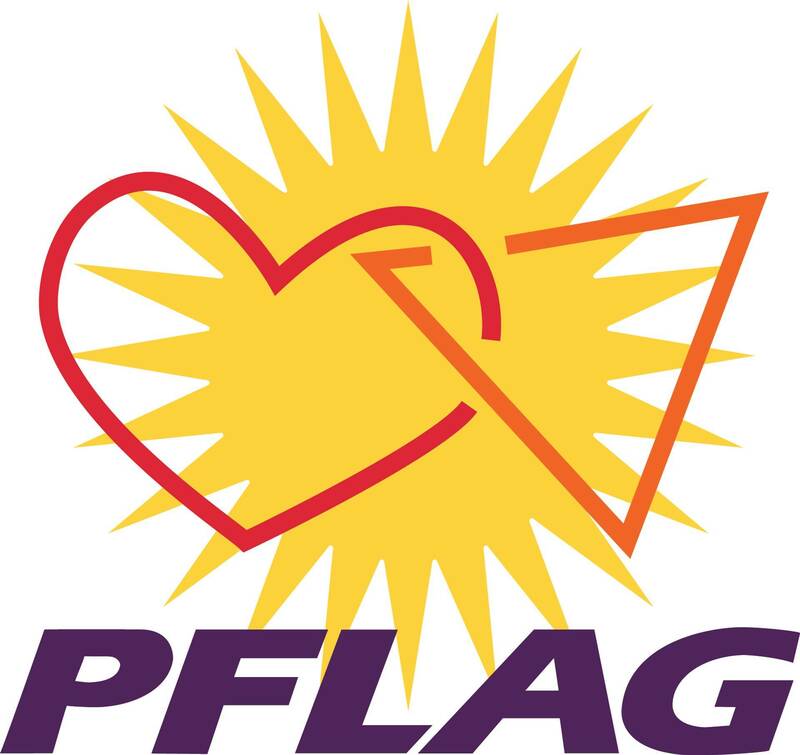 The PFLAG logo may not be reproduced for profit-making purposes. Use of the logo is permitted for incorporation in materials to be sold for fund raising purposes, letterhead, publicity, and whatever other uses are consistent with national objectives and authorized by the Chapter. 1. Membership shall be open to people who subscribe to the purposes of the Chapter and support the Chapter with membership fees as set by its Board of Directors (Board). 2. The Chapter’s Board will set annual chapter dues, a portion of which is remitted to PFLAG, Inc. for national membership dues. 3. Membership is renewable annually and may be terminated by voluntary withdrawal, failure to pay dues, or by the Board for actions detrimental to the purpose of the Chapter. Involuntary withdrawal of membership must be discussed and voted on by simple majority of the board. 4. The list of Chapter members shall be kept confidential and shall not be disclosed outside of the Chapter and PFLAG, Inc.
1. The Government of the Chapter shall be entrusted to its members who shall elect Chapter officers at the annual meeting. The term of office shall be two years, and an office may be held for no more than three consecutive two-year terms In the event that no suitable replacement person comes forward, and every effort has been made to recruit a replacement, then the current officer in that position may continue to serve. Efforts to recruit shall include announcements of available positions by email, at meetings, and by personal invitations to serve Terms of newly elected officers will ru January through December of each year. Nominations to serve on board must be voted on by a simple majority of elected officers. 2. Officers of the Chapter shall be five: a President, a Vice President, a Recording Secretary, and Corresponding Secretary, and a Treasurer. The officers shall appoint additional members to the Board of Directors to carry out the day-to-day business of the Chapter. 3. The president shall preside at Board meetings, special meetings and the Annual Meeting; may conduct the monthly Chapter meetings or delegate this responsibility to a Board member; shall be the chief spokesperson for the Chapter; shall receive and distribute communications from PFLAG, Inc. to the Board. 4. The Vice President shall perform the duties of the President in the absence of that officer; shall be responsible for programming and fund-raising, or delegate these responsibilities as appropriate. 5. The Recording Secretary shall keep minutes of all board meetings and at our Annual meeting and Elections and retain copies for future reference; and see that all notices are duly given in accordance with the provisions of the Bylaws or as required by law. 6. The Corresponding Secretary shall be responsible for official correspondence as directed by the Board; shall send letters of thanks, welcome notes, and informal communications as deemed appropriate. 7. The Treasurer shall have charge of all monies of the Chapter and deposit same in the name of the Chapter in a financial institution approved by the Board; shall maintain a record of all receipts and disbursements of the Chapter; may or may not be a signatory on the Chapter’s checking account; shall present monthly financial reports to the Board; and shall prepare an annual financial report for the Chapter Annual Meeting and for PFLAG, Inc.
1. The Board shall consist of the Officers and as many additional members as the Board determines and appoints. The Board shall conduct the business of the Chapter between Annual meetings. A simple majority of the Board shall constitute a quorum for the transaction of business. 2. Vacancies on the Board may be filled by appointment by the remaining Board members. 3. Board members shall be dues-paying Chapter members in good standing. They are expected to attend regular membership/support meetings as well as Board meetings. At the discretion of the Board, Board members having three consecutive unexpected absences from Board meetings may be asked to resign from the Board. 1. The Chapter shall hold regular support meetings. 2. The Chapter shall hold an Annual Meeting in November to elect officers and receive reports. This follows the close of the Chapter’s fiscal year on September 30th. A quorum shall consist of 10% of the Chapter members. Additional business may be considered at the Annual Meeting at the initiation of any member present. Written notice of the Annual Meeting shall be mailed or e-mailed to Chapter members at least two weeks prior to the meeting Voting shall be by a simple majority of votes cast by the members present. Any Chapter member in good standing and present at the Annual Meeting shall have the right to cast one vote. Artie VIII: Chapter Liaison with PFLAG, Inc. The chapter shall maintain open communication with PFLAG, Inc., submitting such information and reports as requested by them in a timely manner. Proposed changes to these Bylaws shall be voted on and approved by the majority of the Board of Directors. Bylaws will be presented to any chapter member upon request. 2. That the foregoing Bylaws constitute the Bylaws of the Chapter as duly adopted at a meeting of the Board held on January 26th, 2019.